Kickboxing is a fighting method where in the kick-boxer uses both hands and feet, as in Karate. It has become a popular sport because of its realistic and practical method of fighting. Kickboxing is similar to 'Full Contact' Karate, as the goal of Kickboxing is to knock out the opponent. Also in Kickboxing, strikes are delivered full force. Kickboxing combines elements from Karate and Thai Boxing. One popular form of kickboxing is known as aerobic or cardiovascular (cardio) kickboxing, which combines elements of boxing, martial arts, and aerobics to provide overall physical conditioning and toning. Unlike other types of kickboxing, cardio kickboxing does not involve physical contact between competitors - it's a cardiovascular workout for the body. 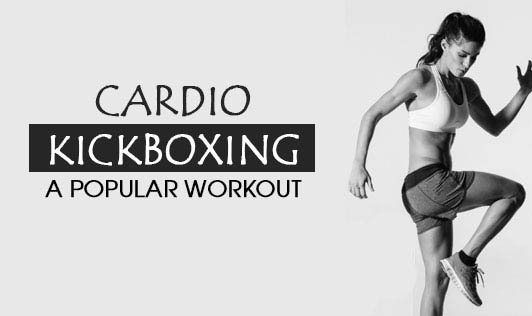 Cardio kickboxing workouts usually start with 10-15 minutes of warm-ups like stretching and traditional exercises such as jumping jacks and push-ups, followed by a 30-minute kickboxing session that includes movements such as knee strikes, kicks, and punches. Some may even use equipment like punching bags or jump ropes. After this, at least 5 minutes should be devoted to cooling down, followed by about 10 minutes of stretching and muscle conditioning. Stretching is really important as beginners can strain ("pull") their muscles. Slow and proper stretching helps relax muscles and prevent injury. Besides keeping your body fit, kickboxing has other benefits. You can burn anywhere from 350 to 450 calories an hour with kickboxing! Kickboxing reduces and relieves stress. Practicing kickboxing can help improve balance, flexibility, coordination, and endurance of the body. Kickboxing is a great way to get a total body workout while learning simple self-defense moves. It will facilitate us to feel more empowered and confident once we start practicing this workout. So get out and start to punch and kick your way to fitness.